advancement of human rights and human dignity for all. 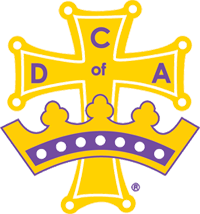 From its inception in 1903, Catholic Daughters of the Americas has grown and developed into the largest organization of Catholic women in the Americas. Under the patronage of the Blessed Mother, its member are united by their faith in Jesus Christ and their devotion to the Church and the Holy See. The purpose of the organization are to participate in the religious, charitable and educational Apostolates of the Church. 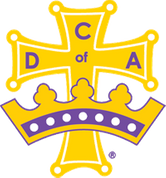 Catholic Daughters of the Americas engages in creative and spiritual programs which provide it members with the opportunity to develop their special God-given talents in a meaningful way and positively influence the welfare of the Church and all peoples throughout the world. National Officers are (l to r): National Secretary-Treasurer Susan Mone, Arizona; First Vice National Regent Vickie Feist, South Dakota; National Regent Olga Samaniego; National Regent-Elect Sherry Nilles, Iowa; Second Vice National Regent Emily Guilherme, California. National Directors are Carolyn Malik, Texas; Carol Bogacz, West Virginia; Marialice Sagan, Michigan; Essie Walker, North Carolina; Rose Holschlag, Iowa; Connie Dronette, Louisiana; Debbie Lattus, Maryland; Susan Hicks, Wisconsin; and Peggy Guckin, Pennsylvania. Congratulations to our very own State Regent Connie Dronette. She is 1 of the 9 National Directors. This picture taken after the Installation Mass on April 30, 2017 are: State Secretary Margaret Comeaux, First Vice State Regent Dawn Fortenberry, (Celebrant Reverend John Carville), State Regent Connie Dronette, Second Vice State Regent Pam Melancon and State Treasurer Becky Shillings . Reverend Edward J. Richard, M.S. As your recently appointed State Chaplain, I am so happy to be able to introduce myself to you. Currently, I am the Pastor of Our Lady of Prompt Succor Parish in Sulphur, Louisiana, the home parish of our State Regent, Mrs. Connie Dronette. I have been the pastor here for six years. I am a member of the religious community of the Missionaries of Our Lady of LaSalette to whom this parish has been entrusted almost since its founding in 1919. I entered religious life in 1985, having graduated from Louisiana State University Paul M. Hebert Law Center and practiced law for a couple of years in Lake Charles. I studied for the priesthood in St. Louis, Missouri, and completed those studies in 1991. I was ordained to the priesthood of Jesus Christ on January 12, 1991, so I have been a priest for over 26 years. My first assignment as a priest was in a parish in Texas where I ministered to both English and Spanish speaking parishioners. I had the great pleasure of administering a mission church in Diboll, Texas, which was predominantly Hispanic. After about two and one-half years, I was assigned to study in Rome at the Alphonsian Academy where I completed a doctorate in Moral Theology in 1996. Upon the completion of my studies in Rome, I was recruited to teach Moral Theology at Kenrick Seminary in St. Louis, Missouri. I served there for 15 years in various positions, predominantly as a professor of Moral Theology and Vice-Rector. I am delighted to be back here in the Bayou State as a pastor, and I hope to remain here for many years. I am unfailingly grateful to Our Lord Jesus Christ and His Holy Mother for allowing me to become a priest. 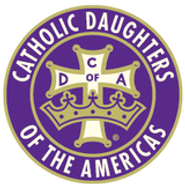 I am deeply impressed with the Catholic Daughters of the Americas and their leadership in the Church. I am completely taken with our local Court of Our Lady of LaSalette, and the formation of the Junior Catholic Daughters in our parish has brought us all much encouragement and joy. I look forward to serving you, my sisters, in our joint mission. Louisiana State Officers attend State Officers Conference presented by the Catholic Daughters of the Americas National Board in Belleville, IL. from l to r: Second Vice State Regent Pam Melancon, State Secretary Margaret Comeaux, State Regent Connie Dronette, State Treasurer Becky Shillings, First Vice State Regent Dawn Fortenberry. Hope you enjoy our website. We encourage all courts to establish a website for your own court.